The field next door to my studio is often frequented by deer. Here is a buck, which I've seen occasionally. 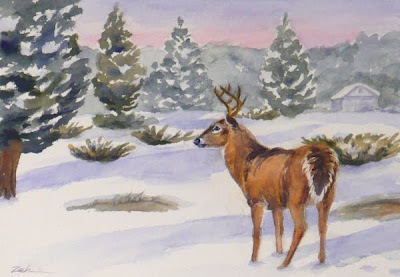 I've painted him standing in the early morning light, the sky a rosy pink and the winter sun casting long blue shadows across the snow. This painting has been sold. See my art for sale at JanetZeh.Etsy.com. Thanks for stopping by.